The bottom tier is an 8 inch, 4 layer round. It was extra tall. The top tier is a Wilton sports ball pan. The bottom tier was covered in fondant and decorated with molded letters and handmade balloons. 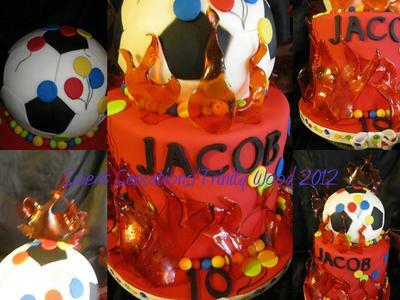 The top tier was made by carefully piecing together hand cut hexagons and pentagons to get the soccer ball pattern. It was very tedious but so worth it! I added balloons to tie the theme together. The flames are made from hot sugar and poured out onto silicon mats in the shapes I liked. After they set but before they were entirely hard, I shaped them and curled them a bit to look more realistic. I had to use a torch for some of them as they cooled quickly. I affixed the flames to the fondant with a torch. The borders around both tiers were made with multicolored balls of fondant to resemble the balloons on the cakes and the fondant-covered board's ribbon trim. This cake was made with love for an Icing Smiles recipient.